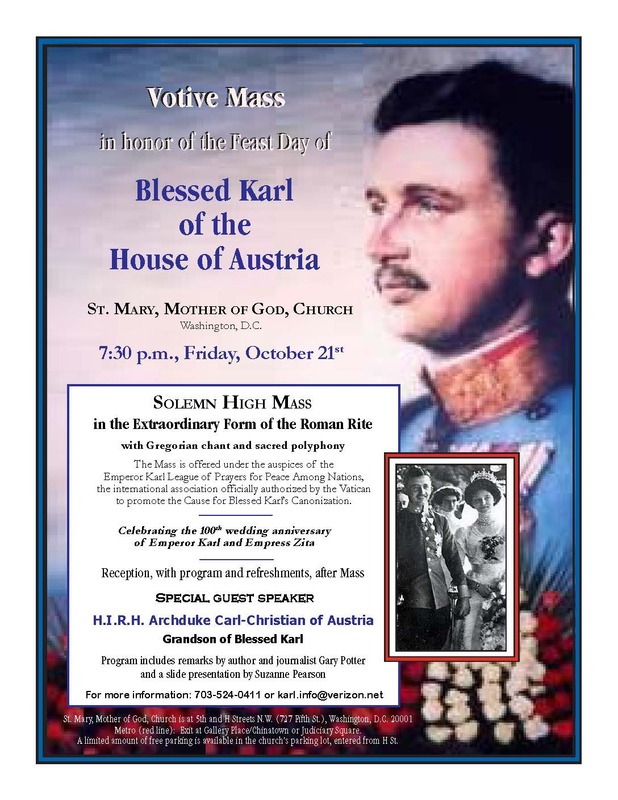 St. Mary, Mother of God Church in Washington, D.C. will celebrate the Feast Day of Blessed Emperor Karl of Austria with a traditional Latin Solemn High Mass on Friday, October 21, at 7:30 p.m. After the Mass there will be a reception downstairs, with refreshments and a program about Blessed Karl. This is the fourth year in a row that St. Mary’s has offered a Feast Day Mass for Blessed Karl. Since Blessed Karl has been beatified but not yet canonized, the Mass is offered under the auspices of the Emperor Karl League of Prayers, the ecclesiastical entity authorized by the Vatican to promote his Cause for Canonization. The head of this international League (the Kaiser-Karl Gebetsliga) in the United States, Brother Nathan Cochran, O.S.B., will be in attendance, and will bring books and materials about Blessed Karl. The Mass will be celebrated by Fr. Gregory Pendergraft, F.S.S.P, assisted by two other members of the Fraternity of St. Peter as deacon and subdeacon. Representatives of the Knightly Orders of St. George, Malta, the Holy Sepulchre, and St. Gregory will participate. The featured speaker of the program after Mass will be His Imperial and Royal Highness Archduke Carl Christian of Austria, a grandson of Blessed Karl. Archduke Carl Christian will be accompanied by his wife, Her Imperial and Royal Highness Archduchess Marie-Astrid of Austria. After the program, there will be ample opportunity to meet the honored guests and to mingle with other participants. The next day, Saturday, October 22nd at 2:00 p.m., Archduke Carl Christian will give a talk about his uncle, H.I.R.H. Otto von Hapsburg, the eldest son of Blessed Emperor Karl, who died this past July 4th at the age of 98. The Archduke will again be accompanied by his wife, Archduchess Marie-Astrid of Austria. After the lecture and Q&A, there will be a reception and opportunity to meet the Archduke and Archduchess. This second event will not be held at St. Mary’s, but rather at 722 12th St., N.W., directly across from Metro Center. There is both street parking and paid parking in the area.